Here’s another classic chrome from my Screen Saver file. Milwaukee Road-era searchlights light up a foggy evening at Brookfield, Wisconsin on CP Rail’s Soo Line Milwaukee-Twin Cities route. Exposed using a Nikon F3T on Fujichrome Provia in 1996. Milwaukee Road Depot at Brookfield, Wisconsin in the Snow. On January 19, 2019, TRAINS Magazine’s Brian Schmidt and I visited the old Milwaukee Road Depot at Brookfield, Wisconsin to photograph a westward CP Rail freight. It was cloudy and snowing lightly. Working with my Nikon F3 and 50mm lens, I exposed these views on Ilford FP4 black & white film. I processed the film using multi-stage development in Ilford ID11 mixed 1-1 with water, then toned the negatives for 7 minutes in a selenium solution to boost highlights. And Which Railroad is This? UP on CP: Freight at Duplainville—Part 2. Duplainville, Wisconsin is a busy place for rail freight. Here are two to four views (up loading difficulties makes the final number uncertain) of an eastward empty unit coal train on the old Milwaukee Road, now CP Rail, with Union Pacific GE diesels fore and aft working as distributed power. In the trailing photos you can see the diamond crossing with Canadian National’s Wisconsin Central line from Fond du Lac to Chicago. Light snow made for added drama. A Union Pacific GE Tier 4 leads an eastward empty unit coal train from Portage, Wisconsin. I exposed these with my FujiFilm XT1 fitted with an 18-135mm Fujinon zoom lens. Chicago Metra’s Milwaukee Road Heritage Locomotive—North Glenview. Yesterday afternoon Trains Magazine’s Brian Schmidt collected me at Chicago’s O’Hare airport and we made our way to the Metra station at North Glenview, Illinois, where we intended to incept outward commuter train 2125. As anticipated, this was led my Metra’s recently painted Milwaukee Road heritage locomotive. As the blue glow of dusk settled over North Glenview, the northward 2125 came into view, its oscillating light drawing a figure eight in the evening gloom. Working with my Lumix LX7 and FujiFilm XT1 digital cameras, I exposed a series of photographs as the train made its station stop. Lumix LX7 photo at North Glenview, Illinois. White balance set to ‘A’ (Auto). These are a few of my FujiFilm XT1 and Lumix LX7 digital photos. To make the most of dusk, I’d set the while balance to ‘daylight’, while taking a low angle to make the unusually painted locomotive seem more dramatic. FujiFilm XT1 with 27mm lens. White balance set to ‘daylight’. Brian Schmidt checks his results. Lumix LX7 snapshot. Daily Post: Old Milwaukee Road Station, Brookfield, Wisconsin. November Views of a Station; Get Your Photos Soon, Before its Too Late! Brookfield, Massachusetts; Brookfield, Illinois, and now Brookfield, Wisconsin—Have you noticed a theme? Classic old wooden station at Brookfield, Wisconsin. Exposed with a Canon EOS 7D with 40mm pancake lens. The former Milwaukee Road passenger station at Brookfield, Wisconsin is located between Canadian Pacific’s main tracks at the west end of a grade separation. This unusually situated station has provided a visual link to the railroad’s past for many years, and is one of the last structures of the old order along this line. Today, Canadian Pacific’s former Milwaukee Road mainline between Chicago and the Twin Cities is largely free from historical infrastructure. The days of an agent working at Brookfield have long since passed. Neither passenger trains nor freights have stopped here in decades. Yet, as of today, the old building survives at its traditional location. Here’s some advice: get your photos NOW. Don’t wait. Word on the street is that the station will soon be either moved or demolished. Looking east at Brookfield, Wisconsin. Lumix LX3 photo. And even if the street gossip changes its tune, the reality is that old wooden railroad stations are ephemeral structures: Never assume the old station that has always stood there, will be there the next time you return. I made these photos last week while re-exploring southern Wisconsin with Pat Yough and Chris Guss . Back in the 1990s, I made a number of photos of this old station, but I’ve learned you can never have too many images of something (or someone) once its gone. Might the old station be preserved? Quite possibly, but it won’t be trackside, and thus will have lost its context. This location without the station will just be another characterless wide-spot along the line. Someone might call this ‘progress’; I call it ‘change’. On Saturday November 9, 2013, I worked with three cameras and photographed the Brookfield station from a variety of angles as the sun came in and out of the clouds. Two eastward Canadian Pacific freights passed giving me ample opportunity to put the old station in context. A wink of sun illuminates the former Milwaukee Road station at Brookfield, Wisconsin. Lumix LX3 photo. Canadian Pacific eastward freight 484-08 led by Norfolk Southern 9189 passes Brookfield, Wisconsin. Canon EOS 7D photo. The sun catches eastward Canadian Pacific freight 248-408 at Brookfield, Wisconsin on November 9, 2013. Canon EOS 7D with 20mm lens. Watch out for rattlesnakes! It seems like a clichéd railfan warning. Although, I’ve encountered rattlers on several occasions, I’d not allowed fear of snakes (or heights) interfere with my photography. In July 1994, I was on a prolonged trip working my way east from San Francisco to Waukesha, Wisconsin. Part of this excursion, was a ten-day exploration of Montana. Working on a tip from Blair Kooistra regarding a interesting photo location, I’d driven down the long rocky road to the old station at Lombard, deep within the canyon of the same name. Back in the day, it was here that Milwaukee Road’s Pacific Extension crossed Northern Pacific’s mainline. 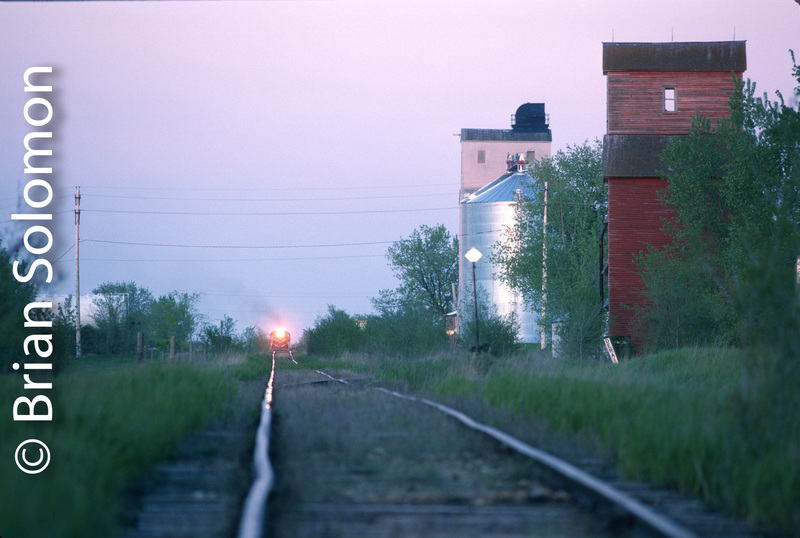 In 1994, as today, only vestiges survive of Milwaukee Road, while Montana Rail Link’s former NP line is the main attraction (if one hopes to see trains moving; the industrial archeologist is likely more interested in the old Milwaukee electrified line). The point of interest, which I’m told featured some GRS upper quadrant semaphores, required a several mile walk west into the canyon. I’d made it about a mile or two from the car when I had an unsettling feeling of being watched. Looking around I realized that several impressively large snakes were sunning themselves on the tracks and eyeing my progress. I determined, that while large, these snakes didn’t have rattles on them, and so probably wouldn’t harm me. I made a few photos of this one coiled in the gauge. Then I continued my westward hike when the bone chilling rattle of the dreaded serpent stopped me dead in the tracks. I looked cautiously to my left, and there coiled in a heap, between the tracks and the river, was by far the largest rattlesnake I’d ever seen. It didn’t look nice. Worse, it seemed poised as about to spring and gazing at me with its tongue listing back and forth. Thus ended my westward progress. There I was, a two mile walk from my car in an unpopulated barren canyon, with probably 20-30 mile drive to anyplace with a phone, and me not having a soul on the planet knowing where I stood! Not good. Without making sudden moves, I reversed direction and carefully retreated on foot back toward the old Lombard station location where my car sat waiting for me. Thankfully, that was the last time I’ve encountered such a beast trackside. Unfortunately, the semaphore I’d hoped to photograph is now long gone. Where’s the photo of the momma rattler? I didn’t make one, primarily because it was lying in deep shadow and I was in bright sun. (Which is as good an excuse as any).